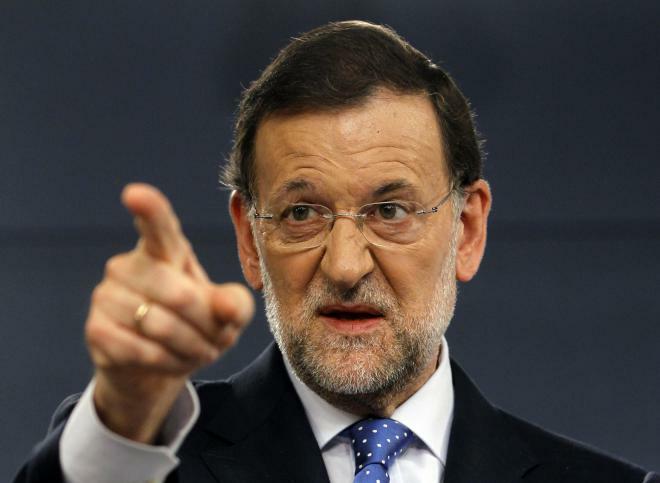 Template:Multiple issues Mariano Rajoy Brey (Spanish pronunciation: [maˈɾjano raˈxoi ˈβɾei]; born 27 March 1955) is the Prime Minister of Spain, elected on 20 November 2011. He has been leader of the People's Party since 2004.Under Prime Minister José María Aznar, Rajoy was Minister of Public Administration from 1996 to 1999 and Minister of Education from 1999 to 2000; he then served as Deputy Prime Minister from 2000 to 2003. Rajoy led the People's Party into the March 2004 general election, an election won by the opposition Spanish Socialist Workers' Party (PSOE) in the aftermath of the 2004 Madrid train bombings. Subsequently Rajoy was Leader of the Opposition from 2004 to 2011. Siblings Mercedes Rajoy Brey, Luis Rajoy, Enrique Rajoy., Mercedes Rajoy Brey, Luis Rajoy, Enrique Rajoy. 1 President of the Spanish government (2011-????). 2 Spanish Minister of Public Administration (1996-1999), Education and Culture (1999-2000), Vice-President of the Spanish Government (2000-2003) and Minister of Home Affairs (2001-2002). 3 President of Spain's Popular Party. 4 Member of the Spanish Parliament since 1986.